JISHOU, HUNAN — Keith Olbermann has justly raked Donald Trump (R-Blowhard) over the coals for his coy suggestion that “we are going to have to see” whether to acknowledge Hillary Clinton as the winner of the election Nov. 8. Trump has also told supporters at his campaign rallies to watch for voter fraud at the polls, leading others to worry about Trump supporters interfering with the voting process, or about possible violence after the results are in. 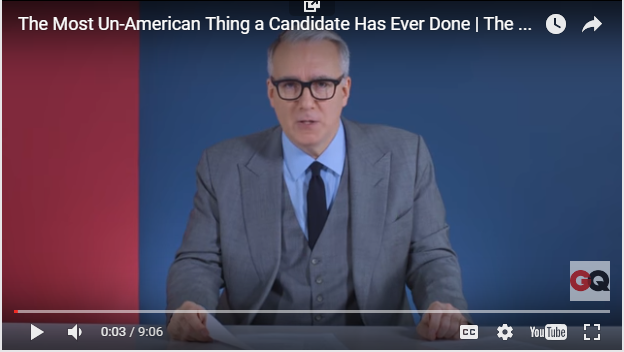 Responding to these remarks on his GQ webcast, The Closer, Olbermann in a fiery broadside salvo accused Trump of single-handedly overturning the entire American electoral process and demeaning the previous 57 presidential elections by suggesting he would not accept the outcome as binding. Citing close and pivotal elections from 1864 to 1960, Olbermann noted that no candidate in history has ever cast doubt on the sanctity of the electoral process, and has never attempted to reverse the outcome in his favor by extra-legal (and unConstitutional) means. Olbermann is right. Trump’s cavalier attitude toward the electoral process is dangerous and un-American. If he loses — and I am dead sure he will — he needs to man up and accept his defeat. He cannot and should not encourage his followers to consider a Clinton win illegitimate even before most people have even voted. If you are a Trump supporter, remember you are an American first. Honoring elections is what we do, no matter whether our person wins or not. Think about that. Here is Olbermann’s righteous rant, in all its glory.